Capturing a competitive advantage—by redefining the process. New designs for faster discharge—and less downtime. Oleoresin extraction, the starting point for many varieties of flavor development, is a long, labor-intensive and costly process. Manufacturers have followed the same recipe for many years, and always with the same results. Loading botanicals into a traditional percolator generally requires at least 6 h.
With the botanicals resting on a perforated plate in the heated tank, solvent percolates continuously throughout the vessel until all the flavor has been removed. Percolation requires 8 to 24 h--usually overnight. When the flavor extraction is finally complete, the worst part of the process begins—discharging the percolator. With the flavor-laden solvent removed, a solidified mass of residual botanical material remains to be discharged. This chore typically consumes 16 man-h or more. The extraction process is also difficult to control. Yield and consistency vary substantially from batch to batch, reflecting natural crop-to-crop variations. For the flavor manufacturer, this presents a huge barrier that must be overcome in order to boost production and deliver a consistently high level of product quality. High costs on the process line, uncertain delivery, and unpredictable product quality are all deadly disadvantages in a competitive market. Recently, a leading flavor manufacturer asked Charles Ross & Son Co. (Hauppauge, NY), to analyze the traditional extraction process and develop a more productive approach. In a collaborative effort, engineers from the two companies eventually agreed on an aggressive plan—to retire every percolator in the plant and revitalize the entire process line. The plan called for four specially designed 2,500-gal Cone Screw Mixers, equipped for heat transfer and vacuum processing. 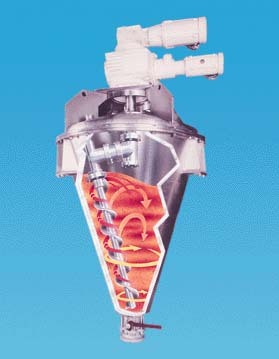 In a Cone Screw Mixer, the mixing screw orbits the vessel wall while it turns and gently lifts material upward. Blending and heat transfer are extremely efficient. Discharge is fast, especially with an innovative mixing screw unsupported at the lower end. Offering an innovative combination of gentle blending, positive agitation, and fast blending cycles, Cone Screw Mixers have long been used in food processing. Since they include no bearings or stuffing boxes in contact with the product they also offer excellent protection against contamination. With vacuum and thermal jacketing, the Cone Screw Mixer is ideally suited for applications like oleoresin extraction—requiring a combination of closely controlled blending and vacuum drying. Following percolation, the solvent is quickly drawn off with vacuum, mild heat and gentle agitation. It is then filtered, condensed and moved downstream for subsequent processing. Because botanicals virtually solidify during the process of percolation and solvent recovery, Ross engineers designed a special truncated section for the lower cone. This provided an unusually large opening for discharge. These giant 2,500-gal Cone Screw Mixers, specially designed for high-volume oleoresin extraction, replaced traditional percolators and streamlined production. They stand 21 ft high, with an 11-ft diameter at the top. In the new cone design, the lower section was also engineered with swing bolts and a slip hinge—to readily drop and swing away from the upper cone. Since the swing-away section supports the solid botanical mass with a platform comprised of a screen reinforced with a perforated plate, this modification made discharge and cleaning easy. The final hurdle to overcome was the need for a specially designed mixing screw that would allow unobstructed discharge, even with heavy botanicals. In an ordinary Cone Screw Mixer, the mixing screw is supported at the bottom of the cone by a bearing that centers the screw and prevents collisions with the vessel wall. But in this case the problem of discharging botanicals required a much more sophisticated design. A support bearing in the lower section of the cone would have caused constant problems. The cost in terms of added labor, maintenance and downtime between batches would have been unsupportable. The challenge was to design an unsupported mixing screw for a blender this large. "An unsupported screw requires an overhead drive assembly strong enough to maintain correct alignment as the screw orbits the cone, without any support at the lower end," says David Hathaway, Ross VP of Operations in the company's Savannah, GA, plant. "A cone-screw blender with an unsupported screw is generally considered impractical in sizes over 200 ft3—a little more than half the size of the blenders we were designing for this application. But the need to cleanly discharge those botanicals was the key to a huge gain in production, so we considered it a design necessity." Today the drive system on each of these giant blenders operates 24 h/d without a lower bearing, and the results are impressive. Discharge is fast, and the regular maintenance normally required by a pintle bearing in the lower cone is eliminated. The new process line picks up speed—and cuts operating costs—at each step. 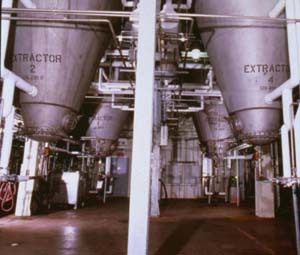 The loading process, which used to require 8 man-hours, now requires only about 4 man-h. Discharging the botanicals used to require 16 man-h. With the unsupported mixing screw and the swing-away lower cone, the process now requires only 4 man-h.
At the end of the line, yields and product consistency are up significantly, since the blenders are extracting everything the botanicals have to offer. With a variable-speed drive combined with vacuum and thermal jacketing, the blenders also provide enormous flexibility to fine-tune the process to optimize results for a wide variety of botanicals. Ron Hoage is a manager in the Technical Services Dept. of Charles Ross and Son Company, Hauppauge, New York.